It's hard to imagine a garden plot without the beds of cucumbers. So it is necessary to do the planting this vegetable. So in the summer you can begin to gather a rich harvest, you should know the rules of sowing seeds. Deciding to put on your vegetable plots of cucumbers, you need a special responsibility to approach this case. Then rises the maximum number of seeds, and the harvest will exceed all expectations. Start to prepare the soil for growing cucumbers is necessary since the fall. You need to make for every 10 sq. m. 100 kg of manure or 400 g superphosphate and 250 g potassium salt. Introduced in the spring of ammonium nitrate in the amount of 100-200 g.
To create a hole for the cucumber seeds need some light. Enough to dig them to a depth of 6-8 cm as to their bottom it is important to put a small layer of humus, which should be slightly moistened. Thus it will be able to create a favorable environment for emergence of seeds. Sow the seeds only when soil temperature rises above +15°. If you do not take into account this condition, the cucumbers may not ascend, as they do not tolerate low temperatures. The sowing must be carried out in several stages with an interval of 7-9 days. The aim of this approach is to provide a high yield. After all, if the seeds planted in the first stage, will die, will those seeds which were produced later. Lay the cucumber seeds need a depth of 4-5 cm, you Can go the other way, creating a small bias when seeding. Then planting will occur at different depths: from 2 to 6, see the result of the cucumbers in any case rise. So, if it's wet the top layer of soil, then sprouts will give seeds finely located, and if more water is present in the bottom, then ascend deeply embedded. Irrigate after planting of cucumbers need to be regularly, it is impossible to prevent drying out of the soil and wilting of the sunrises. To do this required using a watering can. Then the soil will not erode. 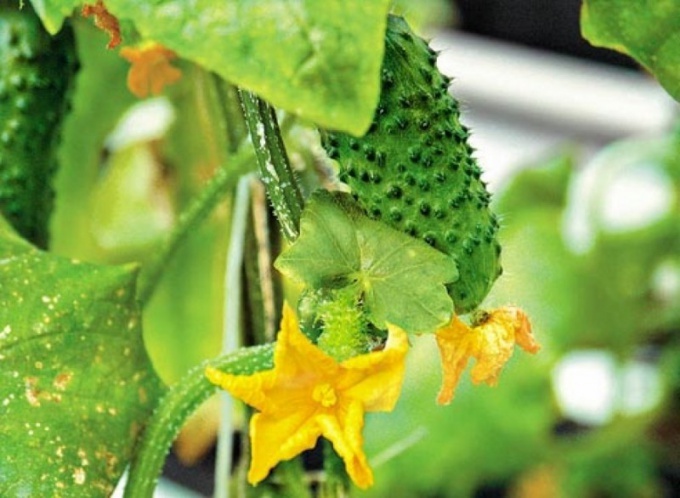 To make the cucumber started to bear fruit as soon as possible, before landing proactice seeds. To do this, put them in a single layer on the cloth, which must from time to time to moisten. After a few days the seeds will give a little sprouts and will be ready to plant. You need to lower them to a depth of 4-6 cm, it is important to place the seed sprouts up. To speed up the sunrise cucumber after planting, cover the beds with a layer of plastic film. It should be left for 2-3 days. Then you need to remove the film and moisten the soil. Already after 3-4 days appear shoots.